To understand the interplay between Copyright law and Open Access, it is essential to consider the justifications for Copyright law. Copyright law emerged out of the belief that there is a need to protect the Science and the Arts in order to encourage their progress. In fact, many countries mention this need for copyright in their constitution (such as the US constitution). The idea is that creators need to capitalize off their work, which would motivate them to keep producing work. They would have a ‘copyright’, which is several exclusive rights for the use and distribution of their work. But since art, science and literature enrich society, and therefore should be open to all eventually, copyrights are not permanent. Therefore, copyright law has described to be a balancing act between the rights of the creator and of the public. Issues debated upon within the context of Copyright law, such as the length of a Copyright, are essentially related to how open or closed the work should be. However, copyright law is ‘one-size-fits-all’, which is supposed to cover everything from the latest blockbuster movie, to a cutting-edge paper on Genetic Engineering. And there lies the problem. While making money from their creations is great for musicians, artists and writers, it’s altogether different for researchers. Musicians, artists and writers usually depend upon earning from their work for sustenance, but researchers are already funded by their government or institutions. The global GERD/GDP ratio (Gross Domestic Expenditure on R&D as a percentage of GDP) is 1.70% in 2013. This means that USD 1.5 trillion are being spent worldwide on research- money that could be used to support a number of other services such as healthcare, education or pension. This massive funding means that researchers are often well-compensated for their work. In any case, researchers make no money from sending their articles to journals. In fact, journals don’t pay their authors, peer reviewers or editors either. Then why do authors sell their work to journals? As Peter Suber puts it, “Scholars write journal articles for impact, not for money”. Scholars choose to publish their articles in high-profile journals because they want the most people to read it, and to benefit from it. This model used to work. But today, journals have become so expensive, that not even the most well-funded institutions can afford them. From 1986 to 2006, the average journal cost increased by 180% while the consumer price index rose by 84%. This means that the prices of journals have been growing at more than twice the rate of inflation. This is termed as the “serials crisis” as libraries were unable to manage their volume of subscriptions with the increasing costs of journals. Because of these prices, University libraries are buying half of the academic books that they did in the 1980s, which ultimately limits the number of people that can access these journals. Very often, authors cannot even share their own work after publishing it in a journal. Why does copyright law allow this situation to arise? It is because the copyright is transferred to publishers when articles are published. For an author of a novel, since they would negotiate a contract with royalty, this transfer enables them to make money, even though the copyright is transferred. Since researchers do not wish to earn from their articles, they usually transfer it to journals for free, along with the copyright. Being for-profit companies, who have a monopoly over articles since they have the copyright, publishers can be selective about what they publish, charge prohibitively high fees for access, and make the profit that was intended to benefit the author. However, this is changing through the Open Access movement. Authors were compelled to publish with conventional publishers before the information technology age, but digitization of research has made it almost cost-free to transfer research. It is probably best explained by the Budapest Open Access Initiative “An old tradition and a new technology have converged to make possible an unprecedented public good. The old tradition is the willingness of scientists and scholars to publish the fruits of their research in scholarly journals without payment. . . . The new technology is the internet”. This is what has fueled the growth of Open Access, a better way for researchers to share their work. With Open Access, the original aim of research to reach the widest possible audience is being met. The Open Access movement does not thwart copyrights, but allows a person to choose the kind of copyright they want, from a variety of types, and therefore have the freedom to share to differing extents. The growth of this movement has allowed the scientific community to share their work in the manner that they wish to rather than be obliged to transfer a standard-length and standard-protection copyright. So even if copyright law is not the best fit for researchers, it’s being adapted in creative ways all over the world, to make it compatible with the aims of scientific research. Harvard Magazine, JANUARY-FEBRUARY 2015. Available online at this link. MIT Press 2012. Available online at this link. This blog was originally posted on the WSIS KC Community Website. The Indian government published the National Intellectual Rights Policy in May 2016. The policy has been formulated keeping in mind that there is a lack of awareness with regard to the obtaining of Intellectual Property Rights in India. The aim of India’s IPR policy is to promote the “knowledge economy”, which the policy defines as “an economy that creates, disseminates and uses knowledge to enhance its growth and development.” This is a goal complementary to Open Access, which aims to effectuate openness in obtaining, publishing and processing research, in order to create a knowledge based society. IPR could be perceived as a restriction on open access because it allows those who invent and innovate to have exclusive rights to the usage of that invention. However, IPR is necessary to encourage creativity and innovation, by allowing inventors to earn from their inventions, but the existing legal regime could be tweaked in order to support Open Access. More information about IPR and the alternatives to the existing IPR regime is here. India’s policy is framed in order to increase the prevalence of IPR. There is even a provision for the creation of special courts for IPR enforcement, which would encourage the usage of IPR. However, some aspects of the policy could be improved upon to have better social impact. For example, one of the objectives of India’s IPR policy is to “Get value for IPRs through commercialization”. This objective states that value and economic reward for IP holders is obtained is through commercialization of IPR. While commercialized rights do protect investors, it is important to recognize that commercialization sometimes means lack of access to information. For example, say an IP holder sells her rights to a large corporation, then this means that they would not be in charge of their own rights. Therefore, a researcher may not have the legal right to share his work even though he may wish to see his research be utilized by others worldwide. The IPR policy does not prevent this utilization, of course, but a blanket promotion of commercialization may inadvertently discourage open access. To illustrate, to encourage commercialization would effectively discourage the usage of APF or repository system of sharing research. The policy also aims to commercialize even publically funded research, infact suggest that R&D institutions should reward researchers on the basis of IPR creation. This may not meet the policy’s aims, as IPR driven research is not always socially beneficial research. Moreover, publicly-funded research is slowly moving into the field of Open Access all around the world. For example, the EU recently announced that all publically funded research should be OA by 2020. Infact, the principles of this policy might not be directly aligned with the goals of the Indian government as well. Prime Minister Modi has expressed the ideas India ruling the 21st century, calling it the ‘era of knowledge’. Various institutions in India, such as the Department of Science and Technology have applied an open access policy across their departments. In 2012, India released the “National Data Sharing and Accessibility Policy”, which tries to improve data management through open access. Such positive steps are benefitting Indian scientists and researchers. The strengthening of the IPR system in India could be improved by taking into consideration the larger societal requirement of sharing of research. An IPR system is beneficial for the holistic development of knowledge, but it is not enough. Research and innovation is complementary and complex, and greater protection for the innovator is not always the best approach. This is the most apparent in the sciences, since research is often expensive and time consuming. In developing countries, sparse resources would be wasted in situations where two laboratories may produce duplicative research. A system which would implement IPR without compromising Open Access would serve the interests of the nation better, and truly make India a knowledge producer. This blog was originally posted on the WSIS KC Blog. Thanks to the Open Access Policy that the India’s department of science and technology (DST) and the department of biotechnology (DBT) introduced last December, open access is at the forefront of research interest and its importance is certainly highly understood to allow researchers to publish in “high quality, peer-reviewed” journals and at the same time giving free access to information and data to the public. 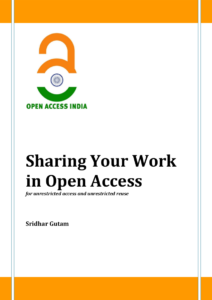 Certainly a key role to this shift has been that of Open Access India, a community of practice that advocates for and assist with all aspects related to publishing using Open Access mechanisms. It might seem surprising that this news are welcome with such enthusiasm as it would probably appear obvious to most people that research results should be available to everyone without any legal or technical restrictions especially when that same public has contributed with its taxes to the research behind the resulting knowledge. Sadly though in many research environments this is not the case- yet! Often knowledge and information is in practice not shared but in fact locked away leaving out a huge percentage of readers who could otherwise benefit from it. The scientific community has been resisting to embrace Open Access mainly because of costs, reputation, and fears of plagiarism. Cost: it is true that publishing on Open Access Journals involves a cost: however, given that governments and donors push for such approach, it should be the same donors who fund the open access publication; all proposals therefore ought to include that cost and fracture it in. Reputation: it is no longer valid the argument that Open Access Journals are not good. Many well-kown journals like Elsevier now offer several Open Access options and it is easy to distinguish the predatory journals from the genuine ones that have as real object that of disseminating knowledge. Plagiarism: by making research results and knowledge accessible and available and thus under everyone’s eye, attempts to copy and misappropriate somebody’s else work will become even more obvious and visible rather than the other way round. All in all it seems therefore that these fears are not grounded while the benefits are enormous. I copy here a wonderful graphic representation done by the Danny Kingsley & Sarah Brown which nails the issue down perfectly. Surprisingly the CGIAR has only recently started seriously this approach. With the aim of improving the efficiency, efficacy, and impact of its research, on 2 October 2013 the Open Access and Data Management Policy was approved by the CGIAR Consortium Board to make unrestricted and free online access to and re-use, by any user worldwide, of all information products generated within the CGIAR research. Open Access is not a fashion or trend; it is a strategy to ensure that research results can become truly international public goods while assisting scientists in building their publication reputation. So if you love knowledge, be kind, share it! 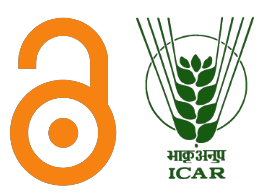 Author Francesca F.ReManningPosted on May 13, 2015 May 13, 2015 Categories Open Access, Open Access Policy, Open DataTags CGIAR, indian open access, Open Access, open access journals, Open Access Policy1 Comment on Be kind…share! 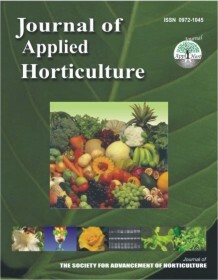 The Journal of Applied Horticulture (JAH) an official publication of the Society for the Advancement of Horticulture based at Lucknow in India had made open some of its articles in Open Access on its website. The JAH had started its publication in 1999 and is making available some of the articles in Open Access from 2000 onwards. This move is a welcome sign in the Open Access movement in the India’s National Agricultural Research System (NARS). We can hope to see lot happening in the area of Open Access in NARS. The credit for this happening should go to the Indian Council of Agricultural Research (ICAR) which recently had adopted a most progressive Open Access policy. The ICAR had also started an online portal for hosting Open Access Journal using Open Journal Systems for the NARS and is hosting about 19 publications. Author openindiaPosted on November 13, 2013 Categories Journals, Open Access, Open Access Policy, StoriesTags Open AccessLeave a comment on Open Access in Happening!!!! The San Francisco Declaration on Research Assessment (DORA) is an initiative of the American Society for Cell Biology (ASCB). It recognizes the need to improve the ways in which the scientific research outputs are evaluated. It recommends that one should not use journal-based metrics viz., Impact Factors as a surrogate measure of the quality of articles and scientists contribution for hiring and promotion. Please read its full recommendations and the Declaration here. The Open Access India requests the scholarly community to sign the declaration and support the alternate metrics of scientific research outputs.